Wander project what dad saw…. It is moving on the Wisconsin River #2 folder. Lots of repeat pictures, which tells me this was probably a slide carousel dad had of the river pictures. My father and my grandfather were both influenced by the University of Wisconsin biologist Aldo Leopold. He studied flora and fauna of the Wisconsin River for many years (publishing many books). Dad got a masters in Biology from the University of Michigan. Door County, which is the county in which Wisconsin Dells sits has some unique flowers that grow along the river. I would love to say that the love of flowers, and plants were passed down to me. Sadly it wasn’t, I love technology and blinking lights! If I may digress for a moment, one of my all-time favorite pictures of my father and I is taken by the Wisconsin River. The location was a favorite place of both my father and grandfather. A spot where the river is wide. Rivers, when they are narrow, and where the ground changes altitude rapidly flow quickly. The two are pretty connected in terms of geophagy and impact. The more a river flows through an area that drops rapidly;y in height the narrower the river tends to be. The narrower the river with the added reality of change in height the faster the water flows. In the spot where my favorite picture was taken, the previously narrow river was suddenly wide. The energy created was suddenly pushed into a wide expanse. The picture is of dad and I standing there, dad’s hand on my shoulder. It remains my favorite picture of the two of us, until many years later at my wedding. I don’t have have a favorite picture of my mother and I. There are many of them that I adore mom and me. Dad took many pictures, and there are many of mom and me together. There are many pictures I adore of my sisters and me together. Some of just my sister and I in Illinois. Some of both sisters and I. Some of the mom, my sisters, and I. There is a picture of me, my sisters and all of us wearing sunglasses in Thailand on the steps of the old palace in Bangkok that I love. I guess having these pictures is really important to me! Today we end the first Wisconsin River folder. The rock formations by the Dells, near Dell’s etcetera, fascinated my father. They fascinated my grandfather as well. There are many pictures of that part of the river by the Dells. More, than pictures I took of the pond that was the edge of our yard in Greenwood Indiana for Eleven Years. Those were all digital pictures, and I don’t have as many pond pictures as the combined pictures of dad and grandpa of the Wisconsin River. I talked before about the reality of a superhighway. That the river once was the best way to get to the southern part of the United States. You went overland to Lake Michigan, not rivers of any impact flow into Lake Michigan. The river basins of the Midwest drain to the Mississippi basin. The mighty Mississippi isn’t the longest river in the world, but it is huge. Smaller than the Amazon River, smaller than the Nile. The Tributaries of the Mississippi include Ohio, the Wabash, the Red, and Wisconsin. Each of the rivers that flow into the Mississippi basin. You can break the US into three distinct basins. The Chesapeake basin is where water flows into the Chesapeake Bay. You can expand that because the bay is truly part of the Atlantic Ocean and call that whole area the Atlantic Basin. In the middle of the Rocky Mountains, there is a line called the Continental divide. The water that falls on one side goes to the Pacific Ocean. The water on the other side goes to the US Basin, the Mighty Mississippi Basin. That Basin made famous by the American Writer Samuel Clemens. Who wrote under the Nom de Plume Mark Twain. Mark Twain is a measurement that Riverboats on the Ohio, Missile and other rivers in The Mississippi basin use. It means the riverboats easily navigate the river. I guess when thinking about the wonder that is a river flowing, I know why my father loved the river. I know why my grandfather loved that river. It represented a path. It also represents a connection to what once was. An artist carving beautiful rocks. A great highway carrying goods to the world. Finally, a place to watch as the world flows by your door. Sometimes you have to look back to see what is coming. The river flows across the state of Wisconsin. It was once, the lifeblood of goods going towards New Orleans. 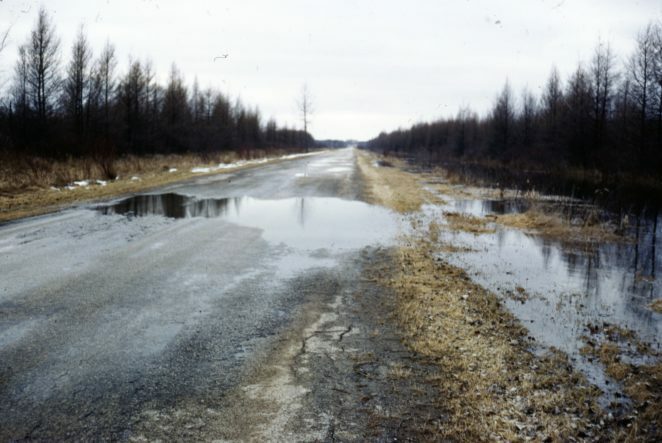 Overland was the route to Lake Michigan. But the river flows to mighty Mississippi and then to New Orleans. Wisconsin’s River named the Wisconsin River, Minnesota’s river named the Red River. All are flowing to form the giant basin that is the Mississippi River. In the time around the 1840s when the river was the only way to New Orleans that Dells was less a stop and more a tiny city, you waved to as you floated by. These were not powered ships, that was to come later with the invention of steam engines and the passage of time. These were floating rafts. Wooden boats with a low draft. Mace to float the river from Wisconsin to New Orleans filled with farm products. It was in the 1880s that Scandinavian Immigrants, seeking a new life in a new land began to fill Door Country Wisconsin. They began wandering the trails left by the First People. Seeking a better life, they filled the land with small farms and having uprooted families changed their names. From Andresen with umlauts’ to Andersen with no emphasis on anything other than I spell my last name with an e. It matters you see, Anderson given to those from Sweden. Andersen is given to those from Denmark. Perhaps an Ellis Island tribute to the great writer Hans Christian Andersen. Or simply that umlauts don’t fit in the land that doesn’t use them: America, Umlaut free since 1776. Two activities that those floating down the river in a boat laden with farm goods as well in the pictures today. In the 1840s people didn’t swim along the boat. They might have, once a week or possibly more often jumped out as a bath. Later with the changes in the world, the river became more of a place to stop and swim. 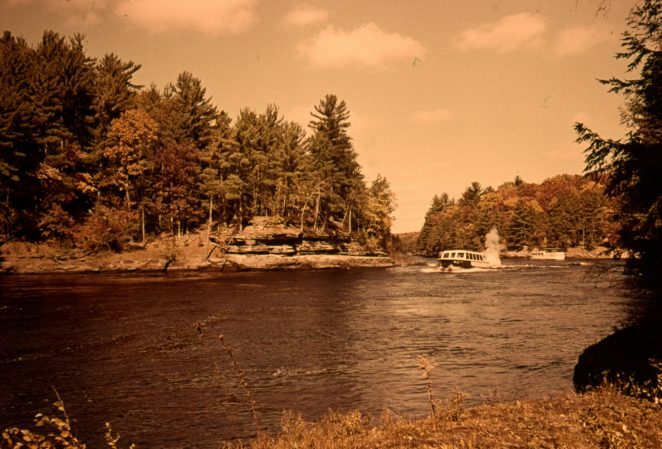 The Dells, once a 20-minute waveform a riverboat heading to New Orleans or destinations along the river became a destination. Tommy Bartlett created his water show. The amusement park opened at the site of the fort that once protected the river. Aptly named Fort Dells. The river continued to flow, continued to carve the rocks. Tourists oohed and ahhed to see what nature had created. All captured in pictures taken by my father. We are now nearly done with the first of two Wisconsin River folders. Dad organized the slides by trays, carousels and then many slides that were loose. When I was little, after we moved to the house in Sycamore Knoll’s dad would show slides in the living room. Mostly when we had guests, but sometimes for all of us. When we lived in Sherwood Oaks, we used to do a TV dinner in the family room. We lived in a split level house. When you came into the house, you saw the dining room and living room with the kitchen walled off but on the same level. The first set of stairs took up to the bedrooms. It was a half set of stairs. The second set of stairs took you to the level with the family room and dad’s office. We didn’t do that as often after we moved. 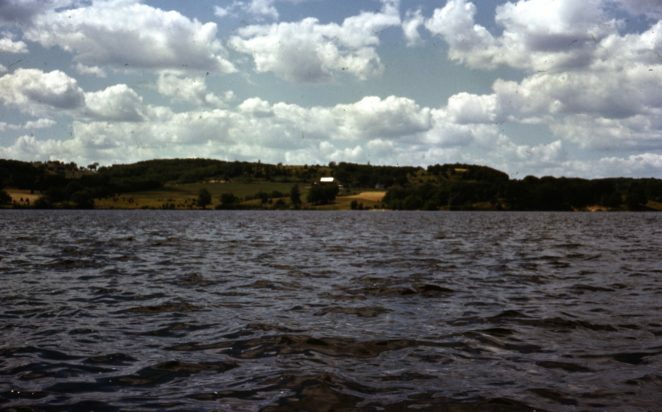 I remember going to Cambridge, where Lake Ripley was located, we would sit in the family room of Grandpa and Grandma’s house, and Grandpa would show old movies. He had a couple of silent film comedies, and course hour upon hour of family movies. We’ve digitized all those films, and they sit on a DVD in my office (2 DVD’s actually) along with all the DVD”s converted now, of our kids as they grew up. Family history being both still and moving pictures. Dad was a still photographer. Grandpa took movies and stills. Mom also took movies, and she took many of the stills that included dad in them. Dad liked to hide behind the camera lens (so do i). The pictures today focused more on the tourist places in the Dells. Dad and grandpa often photographed places that the tourists didn’t often go. But these are the rock formations, the places that the tourists went visited. The tour boats were double-decker twin engine boats. Going up the river, they would move along at 5 to 6 knots. Going with the current or downriver they were a little faster. The boats were not built for speed. They are, still in operation. Mom and Dad took the granddaughters on them in 2011 when we had our family reunion at the Dells. The twins and I ended up playing Miniature Golf as neither of the twins really likes being on boats. The pictures today are some of my personal favorites. Sadly they were also the ones most damaged by time. Most of these pictures were taken between 1956 and 1960. A couple maybe a little later than that. They show my father’s journey’s along the river. They also show the “tour” boats that wander up and down the river. There were three kinds of boats, speed boats (smaller) larger river cruises (seen in the pictures) and former WWII Ducks. At the time we were often at Dells the Ducks then were 30 years old. They are more than 70 years old now. I suspect most places have pulled the Ducks from standard daily use in terms of tours, based on the accidents that have happened. There are also a couple more pictures of the stops that the boats made. They would stop and share some of the simply amazing carving done by the river. The River is a steady hand that is willing to work for millions of years. Growing up in Indiana I learned early about Karst Topography. That is where a shale cap, sits above limestone bedrock. Shale as a rock is less water soluble than Limestone. You can put limestone in tap water (slightly acidic) and if you are willing to wait calcium crystals will grow. If you don’t want to wit, you can put the limestone in water, add a little vinegar and speed the process up. Water that falls from above is acidic. Karst Topography is where the cave formed by the water, collapses and create what is called a Sinkhole. It should be called a collapsing hole. It doesn’t sink. It is not there today, but tomorrow it appears. 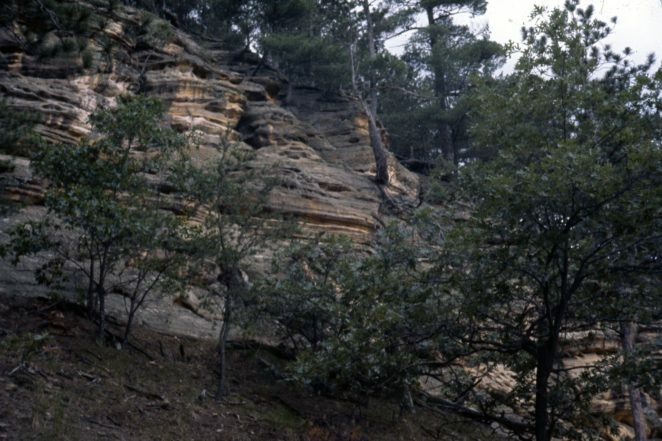 The Dell in which Wisconsin Dells sits has limestone in the hills but no shale cap. A Shale cap results in caves. A Limestone bedrock with no cap results in the twists and turns of the river carving the stone. The tributaries of the river carve as well. Artists are willing to take millions of years before sharing their art! Those were the stops for the boats. They wandered with people up and down that section of the river. Some of the spots, as seen in the pictures today, you can get to via the overland trails as well. Dad drove one of the speedboats for the tourists, but he often with my grandfather hiked to the other locations. I realized this morning that I shared duplicate pictures the last two days, my apologies for that. 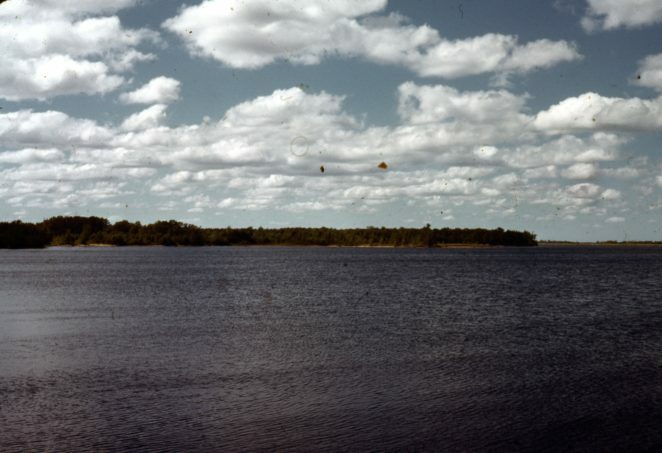 There are a lot of pictures in the Wisconsin River folder. The folder doesn’t hold the river, just the pictures. These include a couple of pictures today of the trails. The Wisconsin Dells experience is two-fold. Well, it’s fourfold. 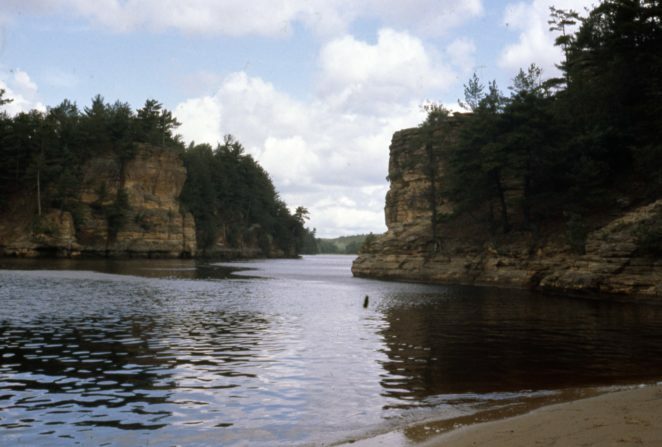 The first part is getting on the tour boats, that make stops at the various natural wonders such as the last few pictures — Rock, carved over millions of years by tributaries of the Wisconsin River. The wooden paths take you back to where the water started, heading downhill always to meet the river. It takes water millions of years to move the rock. Dissolving the limestone and carrying that to eventually the sea. The other part of the experience is Paul Bunyan’s restaurant. Paul Bunyan and his pet ox Babe, are a legend in the Wisconsin/Minnesota area. Paul was logger that stood taller than the rest of us. Now Paul Bunyan is in my eyes more remembered as the name given to an all you can eat breakfast restaurant. I took the twins; I suspect the restaurant regretted seating them. Pancakes, sausage, coffee, and donuts made fresh that day and used to fill the growing Twins. You can’t take a doggy bag from Paul Bunyan’s (all the food has to leave, under your belt!) There is a Paul Bunyan’s’ in the Dells. They are all over the state of Wisconsin, but I had never been to the one in the Dells. Last on the Dells experience is the various amusement parks. I remember going to Fort Dells, which was an amusement park when I was maybe five years old. That was back in the time when Amusement parks were just starting. Disneyland was putting the finishing touches on what would become a family experience never to forget. In 2011 when we returned, the amusement park was massive. We spent a day at the new Amusement park and another couple of hours playing miniature golf at another location. The Amusement park is famous for the wooden roller coaster (Hades is the name). We rode that wooden coaster quite a few times. They also had a cool go-kart track as well that we enjoyed. More pictures of the Wisconsin River, there are a few more to come. 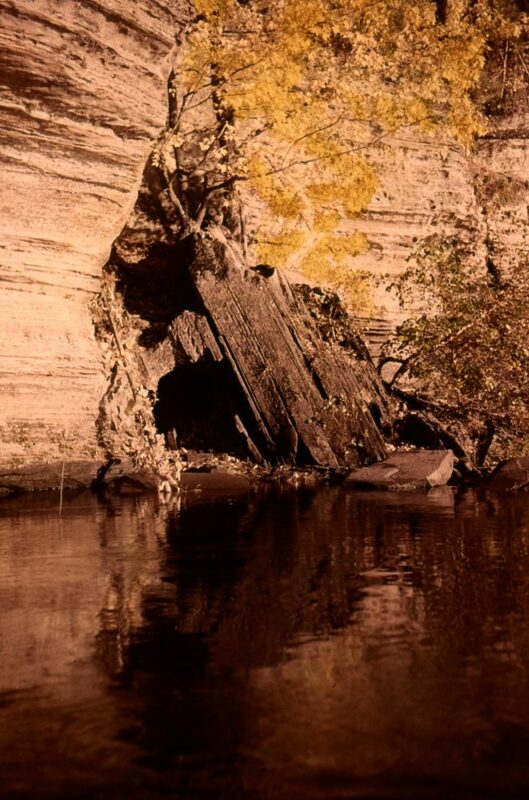 As I’ve said, both my father and grandfather loved the river pictures near the Dells. My father was a huge believer in doing the right things when it is easy, but also when it is hard. The importance of doing the right things permeated my father’s life and showed in the pictures he took. Some of these pictures are hard to get to, but the importance of the picture meant he took the time. It is something that applies to life. If you can’t be honest with yourself then who can you be honest with? What we build as people can at times go away forever. I think back to the line from the Percy Blythe Shelley Poem “Ozymandias. The Wisconsin River flows past Wisconsin Dells, shockingly the section near where the Dells is located in a Dell. A valley filled with trees. Now the Wisconsin River cut the Dell, to make the Dells. Humans have since stepped in adding a dam for flood control. It is the area just down the Wisconsin River from Wisconsin Dells. In that area lies some of the largest cheese producing areas of the United States. California is the largest US Cheese producer, but Wisconsin is a close second. Interestingly there is also a lot of farmers with one plot of Tobacco growing as well. You can always tell a farm with Tobacco because they have the barn with open slats to air dry the Tobacco to be sent to factories and turned into the filler. The interesting reality of tobacco farms today is the US Government pays the farmer not to grow the plant. Perhaps Virily should consider the same rules. To get a payment, you can’t post comments about communication and things like that. I will end with a story my father shared with me many years ago. There was a football coach in the 1960s at Indiana University that cheated, and got Football, Basketball, and Swimming along with other sports banned from competing for titles for four years. It cost Indiana University one of its greatest teams. But, if you cheat you have to be willing to pay the price. My father always told me if you cheat, you have to be willing to pay the price.